Why causes ice pettets (sleet)? Ice pellets (sleet) frequently occurs mixed in with freezing rain, and is made of frozen raindrops. 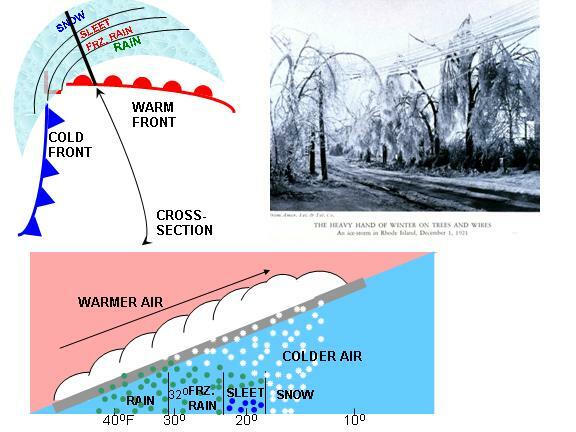 Sleet forms in advance of a warm front in the wintertime in a narrow band, usually sandwiched between an area of snow and an area of rain or freezing rain associated with an extratropical cyclone. Rain being produced in a warm layer aloft falls into a cold air layer below. If the cold layer is deep enough, then the raindrops freeze. If the cold layer is very dry, sleet will more readily form due to evaporative cooling.